2017 was not the year I thought it was going to be. After quitting my job and starting my master's in 2016, I envisioned this year mainly spent travelling, blogging and a lot of hard work studying. In the end, it turned out to be one of the most challenging years I've had in a long time. A year ago, I could never have imagined the crazy turn my 2017 took this summer and it set me back a long way. Turns out sometimes the things you dream about should stay as dreams. Still, I'm (mostly) over that now and things seem to be back on track. 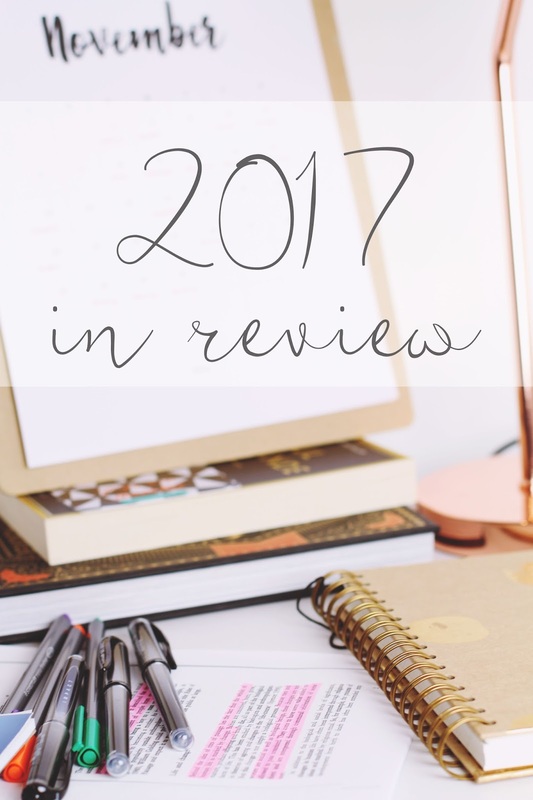 Let's take a moment to reflect on my 2017 goals and see how I fared. Actually, considering that vague waffle up above, I did pretty well on my life goals. I'm both surprised and impressed with myself as I'd written everything off already. Just goes to show, reflecting on your achievements really does make you feel better about yourself. Not only did I complete my MA, but I got a freaking distinction! It was without doubt the most challenging thing I have ever done in my life but I loved (almost) every second of it and the sense of fulfilment when I got that confirmation email was the most amazing thing. I was travelling on a train, alone, sitting next to strangers and burst into tears. Nobody asked if I was ok though. Bloody commuters! I'm planning a final post to summarise my last few months, including an outline of my dissertation, so if you're one of those people who has been intrigued by my study, keep an eye out! This was my goal in 2016 but I missed out by eight books. Finally in 2017, I achieved it! In fact, I went one over with a total of 61 books read throughout the year. Another thing I'm proud of is that I read more pages than any other year since I started keeping track. According to Goodreads, I read 16,484 pages this year, beating my previous best of 15,253 in 2013 (I only read 46 books that year despite the massive page count, because one of my books was 1Q84 at 1318 pages long). I just did it! My plans weren't quite followed through (I didn't visit Copenhagen and I only made one Salzburg trip which hurts my heart!) but I did end up visiting Riga, which wasn't even on my radar at the start of the year. Plus a little jaunt to Venice and my two USA visits: Orlando and New Orleans. The latter of which I still need to blog about. The posts are planned, they just might be a little (a lot) late! I think I can best summarise this one by saying it's gone OK. I definitely haven't put as much effort into it as I should but I've noticed I'm improving bit by bit. One thing that's really helped me is practising wherever I can- I've only made one trip to a German-speaking country this year so I haven't had a lot of opportunity to use it in a real-life context. Instead, I've been picking up German language guides when I visit tourist hotspots, such as the Walt Disney World maps, and using them rather than the English ones. This has really helped with my German reading, although I find it really difficult to translate spoken language. I'm sure that will come with time. Now this is something I've really taken to. I've become quite attached to my hairdresser so when he moved to a different salon in July, he gave me the name of his new place and I followed him. It's a 20-minute drive rather than the previous 5-minute walk but it's worth it. I get a blow dry once a month or so, I've had regular trims and I had finally had a Keratin treatment before I went to Florida. It was amazing to splash around in the water parks and not have my hair frizz up within seconds. I've never been happier with how my hair looks!In the spring, I started a teeth whitening course. I only got halfway through because I hated every second of it but the results were amazing. My confidence has increased so much: I'm smiling with my teeth and I've even been wearing yellow- something I hadn't done for ten years because I was so self-conscious of how it made my teeth look. I'll need a little top up soon but I can't believe how such a little thing has made such a massive difference. In some ways, this did happen. I set up a new travel section to keep all these posts in one easy-to-find place and I've documented my trips from the first half of the year, as noted above. As for the later two trips, I have the content ready to go, it's just... not gone yet. I want to continue this next year, and include some more general travel posts like tips for travelling solo and travelling with hand luggage only. I may not have posted much, but I think it's fair to say I mostly kept to the five key areas of travel, fashion, beauty, books and university. I'm very happy with the content I did post this year, so I'm happy to carry this on into 2018. TICK! After a lot of faffing, I finally chose a new design on Etsy and I absolutely love it! It's exactly what I wanted- streamlined and much more sophisticated than the old one, but still keeping the cute, feminine feel. This is one blog thing I can say I definitely achieved. So 2017 may not have been what I anticipated, but I'm impressed at how much I've actually achieved. Let this be a lesson in the importance of reminding myself of small victories and not allowing myself to get too hung up on the stresses of life. There's a resolution for next year!